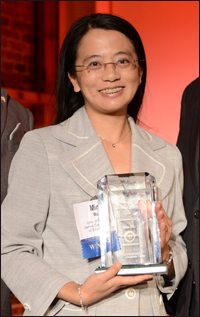 ISR-affiliated Professor Min Wu (ECE/UMIACS) has been honored as a 2012 Maryland Innovator of the Year, for "A Novel Timestamp for Visual Recordings," her invention that can authenticate when and in which geographic region an audio/visual recording was captured. This technology will also allow users to determine if a recording has been tampered with or edited in any fashion, and determine if a visual track and a sound track were captured at the same time or combined after the fact. The awards are sponsored by the Maryland Daily Record. Beyond security and forensics, the innovation can be extended to facilitate the synchronization of various A/V recordings, and help monitor the stability of the power network from simple portable devices (such as a smartphone) in the emerging smart grid paradigm. Dr. Wu developed the technology along with her Ph.D. students Ravi Garg and Avinash Varna of the Media and Security Team (MAST) at the University of Maryland.